Sculptural heritage display commemorates the pioneering tobacco farmers who supported the Myrtleford district for over 100 years. Tobacco was grown in the Ovens River Valley in the 1870s but the arrival of large numbers of Italian migrants in the 1920s and the immediate aftermath of the Second World War saw Myrtleford established as a major tobacco growing centre. Until the closure of the industry in 2006, tobacco was the major crop grown here and today, many of the distinctive corrugated iron tobacco drying kilns can still be seen around the town. Tobacco growing commemnced in the Upper Ovens Valley in the early 1870s, supporting the local Myrtleford area for over 100 years. Due to increasing global competition, tobacco growing in the Upper Ovens Valley ceased after the February 2006 harvest. 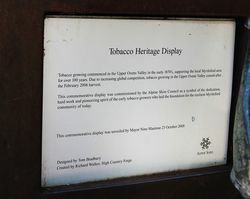 This commemorative display was commissioned by the Alpine Shire Council as a symbol of the dedication, hard work and pioneering spirit of the early tobacco growers who laid the foundation of the resilient Myrtleford community of today.